LAWRENCE – The KU Public Management Center (PMC) held the 68th annual Kansas City / County Management (KCCM) Conference at the Lawrence campus on April 28-29. This year’s conference featured a major discussion on last November’s presidential election and how local governments are needing to lead through uncertainty with innovation. The majority of the KCCM Conference attendees serve as chief administrative officers or department heads in city and county governments in Kansas. They attend this event to connect with one another while engaging around timely issues that affect their communities. 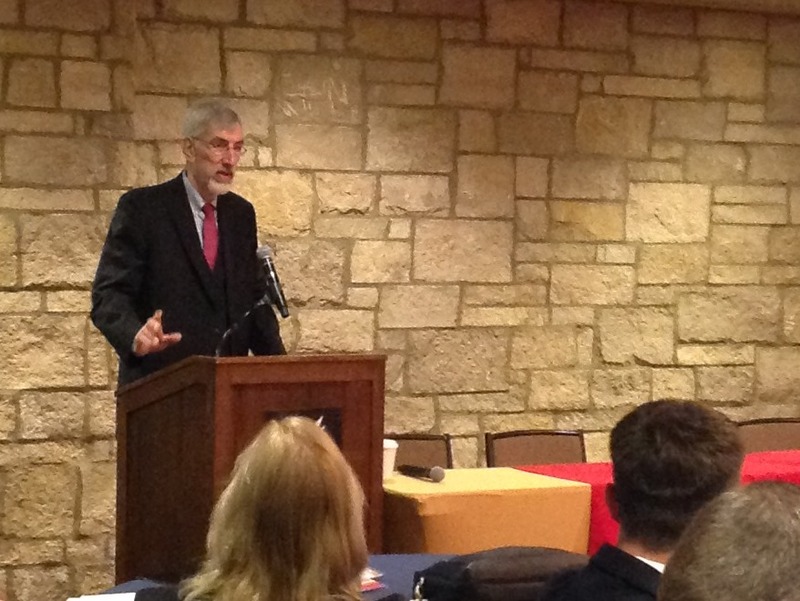 This year’s conference was themed “Leading through Change” and featured a keynote address by Dr. Mark Funkhouser, Publisher of Governing magazine and former mayor of Kansas City, Missouri. In his presentation Dr. Funkhouser described the current political environment as continuing a trend toward “fend for yourself federalism,” where there is a turn away from federal leadership on domestic issues, shifting responsibility to the state and local levels. While this is not new, Dr. Funkhouser highlighted the current twists that are creating additional challenges for cities: state legislatures are limiting what localities can do in setting policies and raising revenue, and half of U.S. states did not meet their budget projections in 2016, largely due to pension legacy costs and deferred maintenance on infrastructure. In the midst of these challenges from the state level, Dr. Funkhouser noted that families – who carry out their lives at the local level – face real challenges in the costs of transportation, child care and healthcare that are unavoidable for cities. The good news? “Cities are where innovation is,” said Dr. Funkhouser. Local governments are in a position to assert influence on the direction of our nation’s future if they can build capacity and competence for performance improvement and create an innovation agenda. But they should be prepared for conflict. “If you’re not creating conflict, you’re not innovating,” he said. After the keynote presentation, a panel of local government professionals reviewed the changing landscape brought about by the most recent elections, discussed key issues impacting local government in Kansas, and provided examples of how local government leaders can effectively address these challenges and lead through change. Two conference attendees, Martina Böhringer and Lisa Krauss, were German students who are currently serving as interns in the City of Mission Hills, KS. For them, the 2017 conference “was a great opportunity to combine [different views on administration] and to expand our knowledge about leadership in different situations.” Read more about their impressions here: http://bit.ly/KCCM2017Blog. A presentation by Dr. Heather Getha-Taylor, Associate Professor in the KU School of Public Affairs and Administration, on the balancing act of internal and external community building. The agenda also included a panel on lessons learned from military experience that can be applied to community building. Panelist DJ Gehrt, City Administrator for Platte City, MO and former Marine Corps infantry officer, has extensive military and civilian experience, including service as a local government advisor for 14 provinces in Afghanistan. He noted that quick wins in places where the US is operating overseas “are often counterproductive, because it means imposing an outside frame to achieve the fast results,” something that is true in localities at home as well. “There can be a real disconnect between our metrics for success and what can actually be measured,” said Gehrt. This benefit of connecting with others working in public service is echoed by conference attendees at another annual PMC conference, the KU Inspiring Women in Public Administration (IWPA) Conference. The 2017 IWPA Conference will be held Friday, July 14, 2017 at the Kansas City Convention Center in Kansas City, Missouri. To register or learn more about the event, please visit http://bit.ly/IWPA2017. The mission of the KU Public Management Center (PMC) is to develop professionalism in the public workforce, provide a forum for policy discourse, and link KU resources to the challenge of public management. The Center is housed within the KU School of Public Affairs & Administration, which consistently ranks among the top public administration graduate programs in the United States. The Public Management Center offers a spectrum of professional programs, including the Kansas Certified Public Manager® Program, Emerging Leaders Academy, Supervisory Leadership Training, Law Enforcement Leadership Academy, open enrollment workshops, and tailored custom courses. Consulting on a wide range of topics related to management and public service is also available through the PMC.